It was exactly one week since I knocked on this neighbor’s door to bring him leftover brownies. It had been a few days since I’d seen him. His smiling face hadn’t greeted me at all over Labor Day weekend from his balcony that always displayed an American flag, but it was humid and even rained a little, so I figured I had just missed him in between going to the lake and hanging out with friends. His apartment was two staircases down from mine, but I still saw him almost every day, especially when the weather was nice. His red car hadn’t moved, but it only does on Wednesdays because that’s grocery store day. So when I knocked on his door that afternoon, I expected him to want to chat. I expected him to tell me that it had been too long since I had visited, which, according to Barnie, is any more than a day or so. I expected him to give me a Barnie hug and to tell him to not stop smiling. I loved his old-man smile. He sometimes even would ask shyly if he could kiss me on the cheek. Of course, I’d say yes, but with a flirty, “you’re trouble,” added on to the permission granted. What I didn’t expect was to knock several times with no answer. Sometimes, he falls asleep in his chair watching the Weather Channel, so I knocked louder. And then again, a little louder. But when he still didn’t answer, I listened and called his name. Loudly. And he finally answered, in the form of a moan or call for help. Sprinting to the apartment office to get someone to open the door and to call 911, my mind went to the worst-case scenario. And, unfortunately, it wasn’t even that good. The paramedics and firemen who arrived on the scene were surprised that he was even still alive. He had been on the ground, unable to move, for probably several days. The bathroom water was running, and he wasn’t wearing any clothes or his dentures, the best guess is that he fell getting in or out of the shower, stumbling over to the living room to call for help, finally falling about three feet from his phone. I sat with Barnie that night in the ER and most of the next day in the ICU. He tried to talk back the first night, but the second day, his eyes communicated how scared he was. He didn’t want me to leave as he squeezed my hand tighter than you’d think one could in his condition. When I left, it was only because he had fallen asleep and I absolutely had to get going. It was hard to think that he might wake up later with no one there, especially because I was leaving town for five days early the next morning. Even though Barnie told everyone that he had no family and that his friends were also dead or all too old to drive, he had mentioned to me once that there was a niece in Virginia and a nephew in Michigan. He also talked about his friend Noah. When the paramedics were loading him up, I took the list of numbers near his phone and googled the area codes until I found one in Detroit and called his nephew. Turns out there were quite a few people who loved Barnie. Over the weekend, Barnie’s health did not improve. Several infections in his lungs, kidneys and other places were the least of his problems. A major stroke had stolen his ability to function and would eventually take his life. His nephew drove down from Michigan, his niece from Virginia, some family from Tennessee and friends from all over. The tough decision was made to transfer him to Hospice where his life would end as peacefully and pain-free as possible. Multiple voice mails a day updated me with his condition, and when I returned to Atlanta, I was able to see him on Tuesday, the day that he would eventually die. I held his hand again and watched him sleep. Visitors over the weekend saw his eyes open and follow them around the room. His heart beat would increase when familiar faces arrived, and he squeezed many hands. He tried to talk but couldn’t. I met his nephew in person only hours before he died in the same parking lot where I had met Barnie over a year ago. He and his wife talked about how they had gotten in touch with the girl who Barnie always wished he had married. His buddies with whom he had gone camping once a year for over 40 years – his old army buddies, college friends and childhood companions – came to see him, too. He retired at 46-years-old and stayed in Atlanta. There were dozens of arguments to try to get Barnie to move into an assisted living community, especially the past few years as his eye sight seemed to get worse and his memory quickly followed. But Barnie was stubborn and refused. He never filled out the documents for a will or for what to do in case of a medical emergency. He refused to go to the doctor and hid secrets from family like a teenager from his parents. Yup, Barnie was definitely stubborn. He lived the way he wanted to….and I’d say that he died that way, too. He never had to move out of the tiny apartment he had called home for almost 23 years or had to depend on anyone. 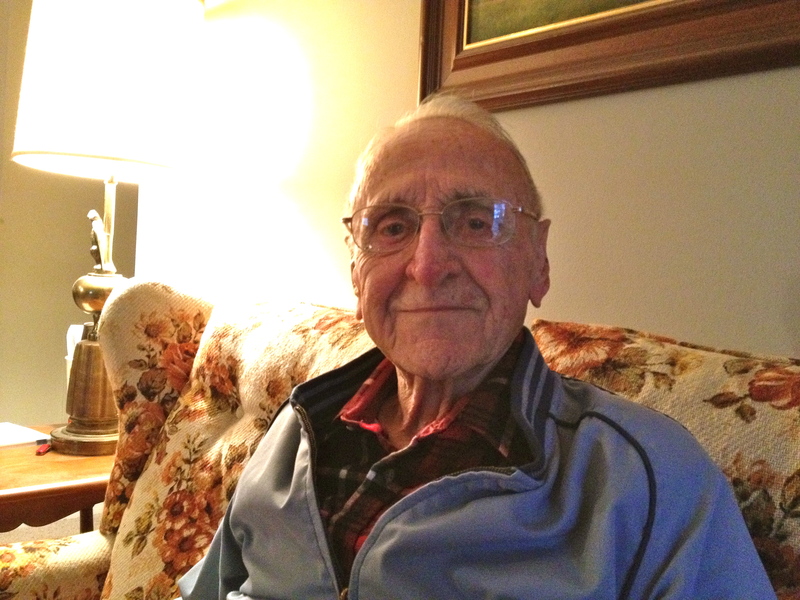 He served his country in WWII, worked for Lockhead and was a life-long bachelor. The only instruction that he left in writing and told people in person was that when he did die, he wanted no memorial service, no funeral, no celebration of life…nothing. He wanted to be cremated and his ashes disposed. That seems a little uneventful for someone who lived almost nine decades, the last of ten siblings in a generation to be alive. The man who smiled at me every day and let me come sit on his couch. He seems to deserve more. But that’s what the stubborn man wanted, so his family is giving him that. Oh Heather . . . what a moving tribute. Such a blessing that you were able to be there with him. Every life is so precious. Wow – thanks Heather, for sharing about Barnie. You were a great friend to him – you have a wonderful heart! Big hug. And a beautiful post. Thank you. Thanks…Sarah, Tara & Krista! Knowing him was such a blessing! I will miss his smiling face so much. I keep looking up at his balcony where the American flag still hangs to wave hello.